I have a confession to make. As the owner of a head of long brunette hair, I know the struggle to carry off white all too well. As I have worked my way around London trying on gowns, I have steadily become more and more resentful of blondes. The tendency for white to make darker haired women look a little sullied or swarthy; evoking a backstreets of 1950s Italy temptress; seems inescapable. If you noticed this summer's trend for the white lace dress as dreamed by Dolce & Gabbana, Erdem and Fendi you will no doubt have also noted its being predominantly modelled by those blessed with honeyed, cherubic locks. Light naturally seems to incline towards lightness. It is a fact that up against anything deeper than cognac tresses, traditional bridal white is better friends with our Grace Kelly and Marilyn Monroe sisters. Which is why I'm so devastated by Alberta Ferretti's second bridal collection for this autumn/winter, Forever. Showcased by beautiful socialite Poppy Delevingne; who lends them a fashion-forward, fresh, almost Swedish cool; these gowns are made for that particular breed of sublime, ethereal bride. Who is most probably blonde. 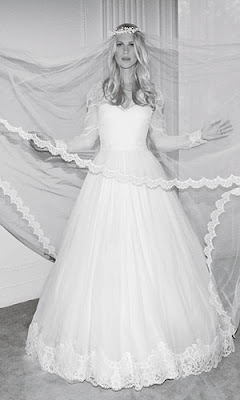 The complete bridal line is highlighted by Scarlett, an airy white silk classic ballgown, touched with whisper-thin handmade French lace sleeves (certain to cause a swoon), or Mia a staggered hem cap sleeved dress trimmed with Lily of the Valley silk flower droplets that evoke a nineteen sixties starlet vintage feel. Each is named for a movie star, and with 30-80 hours each in the making feel silverscreen worthy. “I believe that every woman on her wedding day wants to feel like a diva wearing a beautiful dreamy dress. Just like how the Hollywood movie stars create an important presence in red carpet gowns, I also want my brides to feel unique and special in the dresses that I have created for them. This is what I love to call white carpet.” said the designer.